a big change for the better by emigrating. The obstinately rebuilt their houses a little higher up and most of the men went to work in the towns of the North in order to be able to send money home to attain their homes families .Nubia" is the name of a specific ethnic and culture area in Africa. It is part of the Nile Valley, and it lies partly in southern Egypt and partly in northern Sudan. 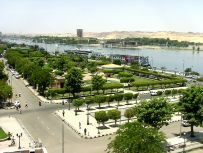 In the north, its boundary is approximately the area of modern Aswan, Egypt. It extends southward, along the Nile, to about the area of modern Khartoum, Sudan, where the Blue and White Niles meet to form the single great Nile. By the measure of the winding river, this distance is about 1000 miles (1600 km). In a straight line, it about 700 miles (1200 km). The northern 200 miles (330 km) lies in Egypt; it is known as "Lower (i.e. 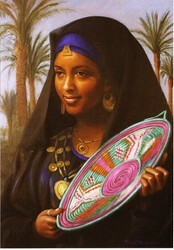 northern) Nubia." In the late 1960's all this land was permanently flooded by the Aswan Dam, and the people were forced to move elsewhere. Today the only preserved and accessible parts of Nubia lie in northern Sudan, which is known as "Upper (i.e. southern) Nubia."